Have you ever suspected that the food you think you are eating is far from it? For example, did you know you’re probably eating crushed beetles and or duck feathers in your favorite fast food sandwich? Before heading to your favorite fast food restaurant and ordering your usual chemical and prescription drug-ridden meal, take note of these alarming facts. 40 years ago, only around $6 billion was spent on fast food. Nowadays, these numbers are extremely alarming, namely, that number is more like $200 billion. Many fast-food companies list the ingredient in their bakery products, since ammonium sulfate is sold by chemical companies to food manufacturers as a “yeast ingredient for bread”. There is some evidence showing that foods prepared by McDonald’s Baked Hot Apple Pie contain duck feathers, or at least an ingredient commonly derived from such. Unbelievable! Another interesting issue of this kind is an enduring urban legend about McDonald’s and their hamburgers which contain cow eyeballs. You can find it in McDonald’s Filet-O-Fish and fries or almost anything deep-fried in a fast food restaurant. Dimethylpolysiloxane is a form of silicone used in stretchy toys, but it also keeps fryer oil from foaming. The mixture popularly known as pink slime includes bones and chicken carcass, chicken parts that you wouldn’t normally eat, ammonia to kill bacteria and small amounts of petroleum. 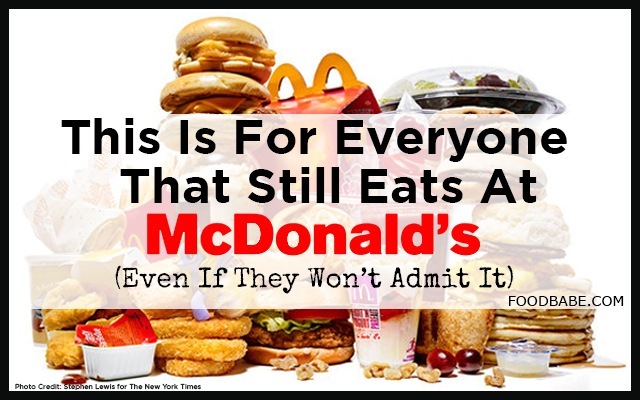 No matter how hard McDonald’s wants you to believe you are eating real chicken every time you bite into their McNuggets, be aware that you are consuming something very artificial and unrelated to real chicken products. McDonald’s uses tertiary butylhydroquinone(TBHQ) in 18 products, ranging from its Fruit and Walnut Salad to Griddle Cakes to McNuggets. TBHQ finds its home in processed foods and is made from compounds derived from petroleum. You can expect processed wood pulp, known as cellulose, in almost everything. It is used in food processors to replace fat, boost fiber content and thicken and stabilize foods.